On September 13, 2008 the SWIFT satellite detected a distant Gamma Ray Burst: GRB 080913. Please notice the two little bulges opposite each other on the periphery of GRB 080913’s flash. Evidently they are twin emerging jets that are emerging perpendicular to our line of sight. 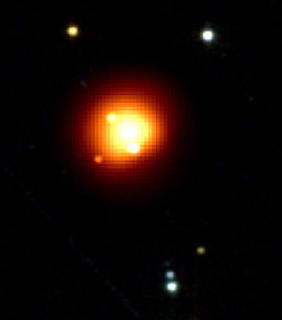 The image is from SWIFT’s X-ray and Infrared telescope. Image credit: NASA/Swift/Stefan Immler. GRBs are powerful flashes of gamma light that usually fade quickly to X-ray and infrared. They arrive from all directions and usually from cosmological distances. For an instant, they can outshine millions of galaxies, brighter than trillions of distant stars. Within three minutes of SWIFT’s detection of GRB 080913, the 2.2 meter La Silla telescope in Chile turned to observe the fading light in near infrared. An hour and a half later the Very Large Telescope (VLT) at Paranal recorded the spectrum of the fading source at 7.6 times the wavelength of local atoms. Most gamma ray bursts last from a few seconds to a fraction of a second and shine from ancient star forming galaxies. 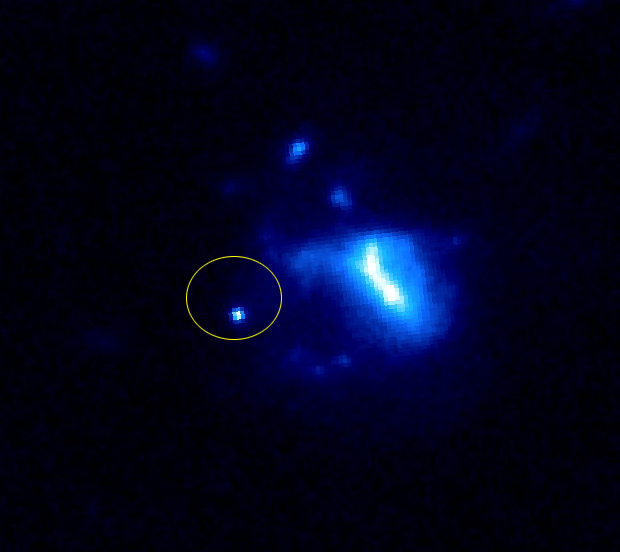 GRB 050709 was a short hard flash with an optical counterpart (circled bright spot) that disappeared in a few days. It shines from the emerging spiral arms of a distant galaxy. (Credit: NASA/STScI/ Penn State/D.Fox) . One flash, from an elliptical galaxy, fired off and on for days. Some flashes originate in supernova explosions (that often produce elongated clouds of gas) in nearby galaxies. Gamma repeaters also shine from nearby galaxies. They are called repeaters because the source can lie dormant for years and then flash again. GRB 070201’s gamma flash was so powerful that it swamped satellite detectors. Yet it only lasted for a fraction of a second. The lines in this picture show the probably location of the flash in the spiral arms around the closest large galaxy: Andromeda (M31). E.P. Mazetes et al Astronomers did not see an optical counterpart of this flash. Soft gamma repeaters sometimes happen in our Milky way, which allows astronomers to resolve the event. 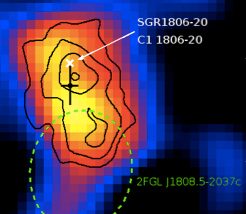 SGR 1806-20 is located in a star cluster on the far side of the Milky Way. 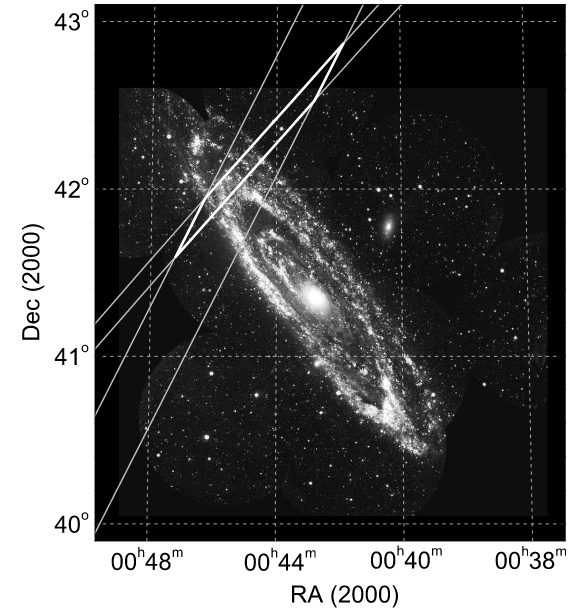 It flashed on December 27, 2004 so brightly that it ionized Earth’s upper atmosphere and swamped SWIFT’s detector. This is a radio map of what happened after SGR 1806-20 flashed. (The black cross is the location of the gamma flash). The elongated structure is shown in radio waves as observed by the High Energy Stereoscopic System. The VLA radio telescope also showed globs emerging from the source and spreading out. How did the universe form, according to the Hebrew text? God created (completed verb) the heavens and the Earth first. It began in multiple places, the plural heavens and the local earth, not with a single big bang. The universe did not look as it does today since verse two explains that the Earth was (completed verb) unformed and dark. How did the earth receive form? God’s wind intensely dithered in unbroken continuity above the surface of the abyss as He continued to command light to continue to be (imperfect verbs). Imperfect verbs refer to repeated or continuing events. They do not tell us if or when God may have stopped commanding light to be. To this day, light dithers around within all matter, giving it extension and other properties. Half way through the creation week, he continued to command lights in the heavens (imperfect verbs) to shine on Earth. He continued to form these objects, to make them into spreading things (noun raqiya). The Bible repeatedly states that he continues spreading out the plural heavens and calling the stars to come out. Perhaps he was giving form to the starry objects in the same way he gave form to the Earth, by continuing to command light to continue to be). Early galaxies often have tails of distinctly separate star globs that seem to be emerging from their cores. The star globs often shine with different colors than the core of the galaxy. Large elliptical galaxies are often surrounded by a field of X-rays that envelops a cluster of small galaxies. The gas trails in the clusters suggest that the small galaxies emerged from and are orbiting around the large one. The Magellanic miniature galaxies are connected to the south pole of the Milky Way be a river of neutral hydrogen. Evidently they were ejected from the unformed matter in the core of our galaxy. The giant elliptical, M87, has jets as long as its radius and is surrounded by ten thousand globular clusters. Local Herbig Haro stars shoot out oppositely directed, pulsed jets that are even now forming huge, dusty nebulae. When we compare the shape of galaxies at many ranges, we observe how billions of galaxies grew from point sources in their cores. Many of them grew into huge growth spirals as the stars continue to form and accelerate out, evidently from the unformed matter in their cores. How can jets come out of point sources unless something energized, them? Perhaps what energized these galaxies was God continuing to command light to be. Perhaps gamma flashes are evidence for God continuing to energize matter with light, thus actualizing it. Is matter a relation with light? According to Ephesians 5:13, light reveals the truth and exposes error because everything visible is light. It does not merely say we see things because of light but we see because “things visible continue to be light” (Greek present indicative phos estin). If matter is a relation with light, rather than just particles, quantum non locality and duality are what we should expect. Why? The properties of matter are not independent. Matter is a relation with light, not just particles. In local experiments, collisions of intense light can create “electrons.” “Particle” collisions also produce showers of light-like things all the way down, as billions of energetic experiments demonstrate. Are ancient gamma bursts evidence for God periodically actualizing matter by infusing it with light? If we can see such things, whey don’t scientists see them? Science was founded on an inflexible assumption. You can read about the creed of all scientists under In the menu item, Scientific Principles, on this web site. Someone might demand: Doesn’t the Bible count the years since creation? How could galaxies grow in only 6,000 years? Please observe how the atomic clocks in early galaxies shone at tiny fractions of the frequencies emitted by modern atoms. Even local atomic clocks, when compared to their transponded reflections from hours ago (Pioneer Anomaly) also accelerate in the same manner (relative to distance) as the atomic clocks in billions of distant galaxies. It is not just the clocks that accelerate. The stars streams also accelerate outwards as billions of galaxies grew into huge, local, growth spirals. Lift up your eyes and look. Only the literal, Hebrew grammar of the creation account is confirmed in galactic history.